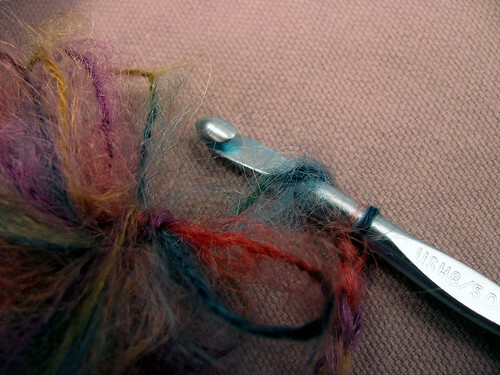 Now that the loop on the crochet hook has been pulled up even with the other loops, remove the crochet hook and put the loop from the stitch holder on the crochet hook. You will see that the yarn from the ball is coming from the middle of the motif and so is the yarn from the loop now on the crochet hook. 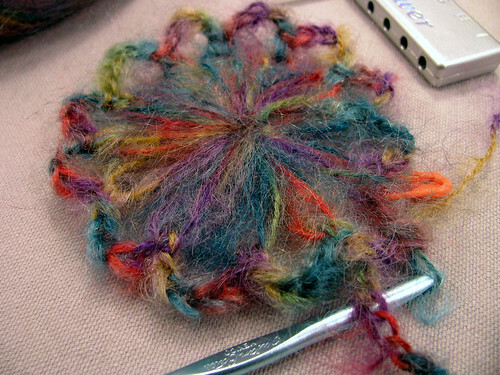 Together these strands form the last loop of the flower motif middle. 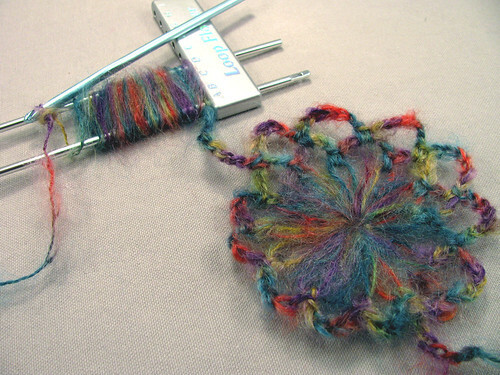 At the same time the crochet hook is moved to the outside edge of the loops. 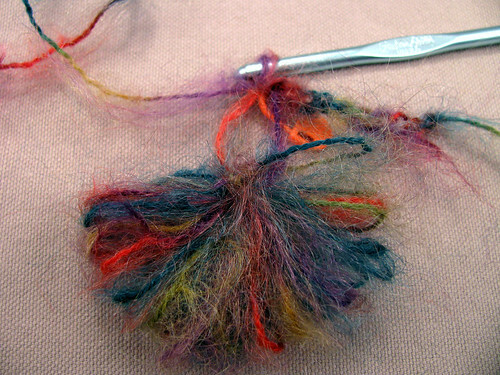 Now is a tricky part, the strand from the ball is picked up from under the strand leading to the stitch on the hook. There should be two loops on the hook like in a single crochet, so bring a loop through both as if doing a single crochet, and the last loop is finished. I should have taken another picture for the next step, but this is where things get fun so I must have just kept going. Pick up the top of the loop that was last pulled up from the middle and do a single crochet through both it and the loop you just finished from the two ends. Next chain 5 stitches and pick up two loops and single crochet together. Then chain 5, single crochet two loops together around the motif. The loops stay in order pretty well so you don’t have to worry about getting them out of order. The photo doesn’t show the next step well. After the last single crochet you chain 2 then put the next chain together with the third stitch out on the beginning chain 10, like doing a slip stitch. So you will be at the top of a 5 chain loop. Next do a single crochet stitch right where you are in the top of the loop and chain 7. 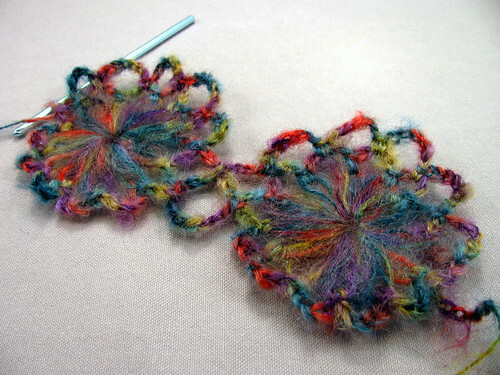 Crochet a single crochet in the top of each 5 stitch loop with a 7 chain in between. Only go half-way around the motif. Then chain 10 and start the next motif exactly the same way as the first one with 22 loops. Keep going only half-way around each motifs, adding as many as you want. You need to join the 7 chain loops by slipping the middle stitch of the first 7 chain loops between each motif. I made 3 motifs in a row then finished going around the bottom of the motifs with the 7 chain loops. 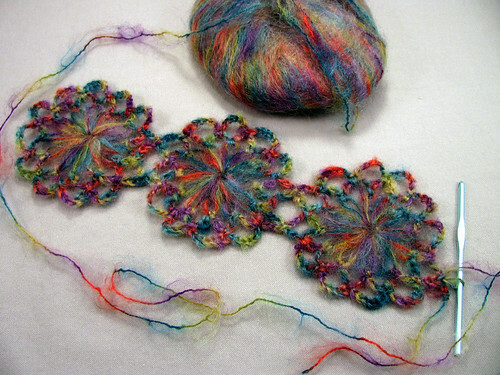 If you are making a design with more than one row of motifs then on the second row you crochet the bottoms 7 chain loops first connecting to the tops of the first row. I still have a lot of thinking to do to explain adding a second row which I will try to do in a better tutorial at a later date. When you get around all the motifs with this first row of 7 chain loops you chain 3 and slip stitch into the 4th chain out on the beginning 10 stitch chain. It is the middle of the 7 chains left after slipping in chain 3 at the end of the previous round. Then do another row of 7 chain stitches with a single crochet in the middle of each loop of the previous round. You will end by chaining 3 and slipping the beginning of the 10 chain giving you the last loop of 7 chains. 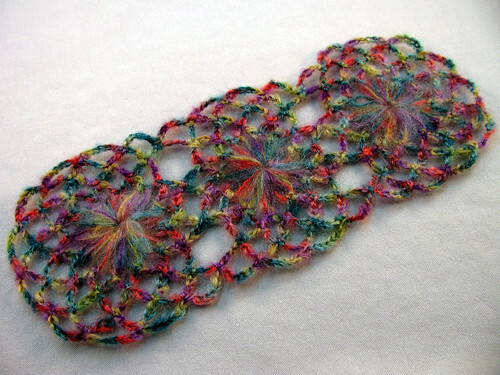 This particular designs has another round of chain 7, single crochet in each 7 chain loop of the previous round border. It will smooth out the sides and make the edging stitches more even. At the end of the last 7 chain loop cut the yarn and use a needle to make the last stitch into the top of the first single crochet of the round. Weave in the ends. Tomorrow I will try explaining the double ruffles made with the hair-pin frame. 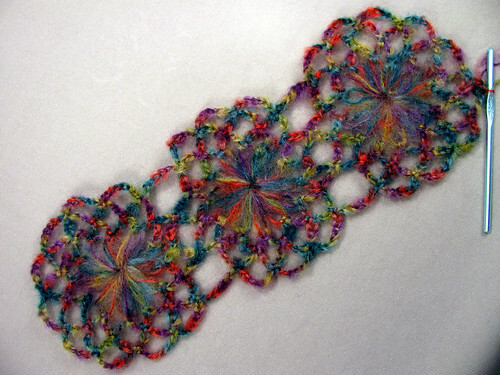 This entry was posted on Thursday, December 18th, 2008 at 3:00 am and is filed under Crochet and Lace. Tagged: Crochet, Hairpin lace, Lace. You can feed this entry. You can leave a response, or trackback from your own site.